The earliest origins of Chateau de Bourdeilles date back as far as the 12th century and, today, the chateau is listed as an Historical Monument and a Major Site of Aquitaine, tracing back eight centuries of history. Situated to the north-west of Périgueux, it dominates the Dronne River from a rocky outcrop. 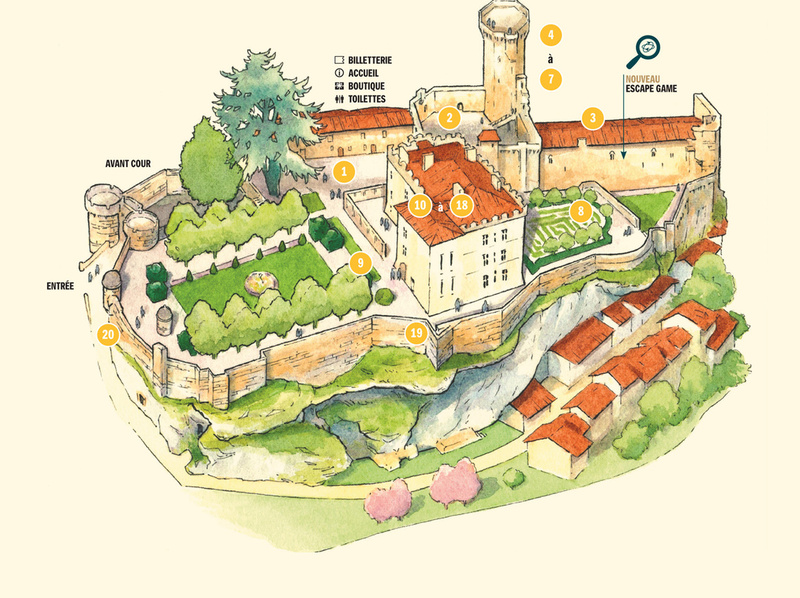 In the Middle Ages, the defensive fort of Bourdeilles was coveted by many. In an era of bloody battles and violent conflict between France and England, Bourdeilles passed from the Kingdom of France into the hands of the English Crown before being freed again by the knight, Duguesclin. By the time of the Renaissance period, a love for all things beautiful and a new, comfortable way of life, led to the construction of a rich, luxurious building juxtaposing the fort. Via the vaguaries of history – and the ups and downs of inheritance - the two chateaux were bequeathed by the last descendants to the département of the Dordogne in 1962 whereupon its restoration was entrusted to two patrons until 1972. The patrons’ passion for the Bourdeilles chateaux inspired them to furnish the Renaissance rooms with an exceptional collection of furniture comprising over 700 pieces. The collection is one of the most beautiful in France and includes precious objects dating from the 14th and 19th centuries. The architecture of the 13th-century castle is clearly military. A high enceinte in which were set machicolations, arrow-loops, crossbow-slits and the defensive castle entrance are dominated by a 35m-high, octagonal keep of surprising linearity. The keep is built over four vaulted levels and has a terrace from which the view is breathtakingly staggering. The Renaissance living quarters, dating from the late 16th century, were modelled on the architectural principals of an Italian Palazzo. Light-filled, richly-ornamented, sumptuous, it displays all the excesses of the Second French Renaissance. Decor dating from the 17th and 18th centuries is still intact and luxurious artefacts from France, Flanders, Italy and Spain transport the visitor back to the golden dreams of centuries past. Live an experience unique in France thanks to the first ever historical virtual Escape Game. Will you be able to escape from this historical adventure in record time?